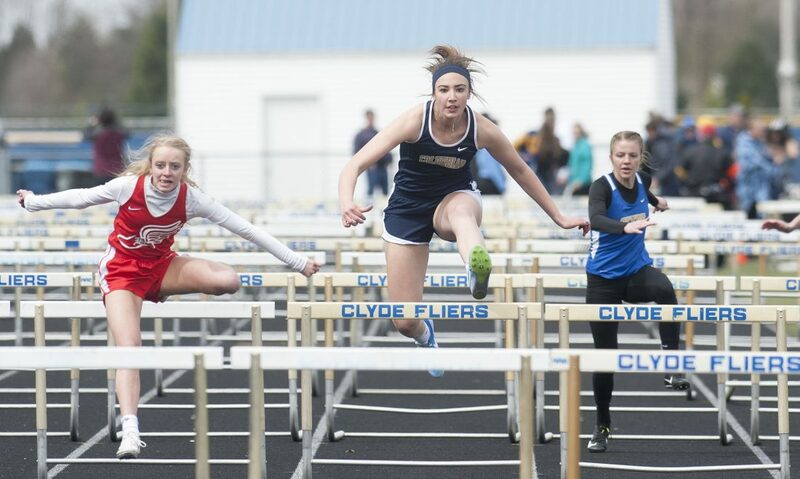 PHOTOh BY REBECCA PADULA Above, Columbian’s MaKenna Kidwell (center), Bellevue's Sydney Waskielis (left), and Clyde's Elaynah Noftz compete in a hurdles event in the Clyde Invitational Saturday. CLYDE — Clyde’s 4×400 team did all it could to give the Fliers a championship Saturday. But Columbian’s 4×400 group had the same idea. The Fliers won the race in 3:37.92, but Columbian ended third (3:39.42), using those six team points — the meet only scored to six places as opposed to the regular eight — to edge Clyde 109-108 1/2 for the team crown at the Clyde A.W. Hendricks Invitational. Robert Daniel, Kerrick Fanning, Nick Koerper and Ryan Sharpe locked up that title in the day’s final race for Columbian. Each also had a hand in other needed results earlier in the meet. Daniel ran fourth in the 400 (53.83). Fanning claimed first in the 800 (2:05.26) and second in the 1,600 (4:48.65). Koerper took second in the pole vault (12-6), fifth in the high jump (5-8) and helped TC capture the 4×100 (45.71). Sharpe added a fourth in the pole vault (11-0) and anchored the Tornadoes to fifth in the 4×200 (1:39.36). Jaxon Harris, Nick Jackson and Kesean Jackson rounded out the 4×100 title team, while Trey Reaves, Harris and Nick Jackson filled out the 4×200 team. Other wins for Columbian came from Kesean Jackson in the 100 (11.2), Caden Groves in the 3,200 (10:42.7) and Drake Devore in the discus (145-2). Devore also finished second in the shot (43-6). Thirds went to Nick Jackson in the 100 (11.68), Kesean Jackson in the 200 (23.41) and Reaves in the 300 hurdles (47.2). Logan Poll took fifth in the 3,200 (11:28.34) and ran with Groves Cameron Koerper and Patrick Marquis to end fifth in the 4×800 (9:13.54). Jacob Marquis added a sixth in the 1,600 (5:04.94). Brock Newsome, Andrew Bauer, Kade Newsome and Adam Koviak brought home the 4×400 victory for the host Fliers. Kade Newsome added victories in the 110 hurdles (16.33) and 300 hurdles (44.55), Koviak claimed the 400 (51.46) and ended third in the 200 (23.31), and Brock Newsome won the 1,600 (4:48.65) and ran third in the 800 (2:06.22). Brady Wilson captured second in the 300 hurdles (46.79) as did Chase Berger in the long jump (19-8 3/4). Other thirds went to Berger in the 100 (11.63) and the 4×200 team of Jayden Johnson, Jarrin Bulger, Michael Daniels and Koviak (1:38.33). Wilson ran fourth in the 110 hurdles (17.12), and the Fliers did the same in the 4×100 (47.85) and 4×800 (9:01.43). Bailey Eberly, Daniels, Bulger and Johnson ran in the 4×100, while Brody Stockmaster, Brock Newsome, T.J. Waugh and Derek Mahler competed in the 4×800. Fifths for the Fliers came from Berger in the 200 (23.94) and Andy Adams in the shot (39-9 3/4). Pole vaulter Zachary Weinheimer (9-6) and discus thrower James DeVanna (121-1) each added a sixth, and Daniels tied for sixth in the 100 (11.94). Bellevue finished fourth in the team standings with 86 points. Austin Thompson and Jake Holmer paced the Redmen. Thompson captured the pole vault (14-0) and Holmer claimed the long jump (19-11 1/4). Mason Miller, Will Hager, Trent Curtis and Kortland Andrews added a second in the 4×200 (1:36.26), Thompson took second in the 110 hurdles (16.4) and Andrews tied for second in the high jump (5-10). CLYDE — Heading into Saturday’s final race with a two-point lead, it was clear what Bellevue had to do to claim victory: win the 4×400 or at least finish ahead of Columbian in the race. The Lady Red did both. Jamie Vogel, Sydney Waskielis, Madelyn Verhoff and Jenna Binger crossed the line in 4:29.29 to secure Bellevue’s 129-125 team title over TC at the Clyde A.W. Hendricks Invitational. Columbian’s Olivia Halsey, Toria Ingalls, MaKenna Kidwell and Serena Ingalls claimed second in the race in 4:31.01. The Redmen had just four wins in the meet, but six seconds and plenty of other depth helped them hold off Columbian. Bellevue’s other victories came from Binger in the 400 (1:05.39), Verhoff in the 1,600 (5:57.66) and Waskielis in the 300 hurdles (49.86). Payton Vogel headed up Bellevue’s runner-up group, taking second in the high jump (4-10) and shot (35-0). The other seconds went to Lindsey Spurlock in the 3,200 (12:47.11), Waskielis in the 100 hurdles (15.88), Binger in the long jump (14-3 1/4), and the 4×800 team of Spurlock, Lilli Ray, Rylee Bollenbacher and Verhoff (10:50.94). Ireland Francis ran third in the 100 (13.5) and anchored the Lady Red to third in the 4×100 (53.9). Keyara Schneider, Amaya Carlson, Jocelyn Morin joined her in the relay. Discus thrower Kaylin Howey also provided a third (106-8). Fourths came from Carlson in the 100 (13.55), Howey in the shot (33-9), and the 4×200 team of Schneider, Leighann Motley, Binger and Morin (1:58.43). Grace Booze also tied for fourth in the pole vault (7-0). Jamie Vogel ended fifth in the 100 hurdles (17.38) and 300 hurdles (53.55), and Schneider did the same in the 200 (28.85). Sixths went to Ray in the 800 (2:45.11) and Spurlock in the pole vault (7-0). Brook Boes shined for Columbian, winning the discus with a school-record toss of 142-6 and also claiming the shot (36-1). The Tornadoes also got victories from Mia Ingalls in the 3,200 (12:47.11), Toria Ingalls in the high jump (5-0), and the 4×800 team of Mia Ingalls, Caleigh Aigler, Maddie Grabert and Toria Ingalls (10:41.33). Serena Ingalls added a second in the 400 (1:05.73), and joined Lizzie Newland, Halsey and Maggie Bremyer on the runner-up 4×200 team (1:55.8). Thirds went to Serena Ingalls in the 200 (28.13), Aigler in the 800 (2:38.05) and Kidwell in the 100 hurdles (16.17). Finishing fourth were Ali Woessner in the 3,200 (13:06.93), Newland in the 100 hurdles (16.65), Kidwell in the 300 hurdles (53.45), Hannah Chance in the discus (106-6), and the 4×100 team of Newland, Lilly Snook, Bremyer and Cadence Feasel (56.03). Ari Remmel also tied for fourth in the pole vault (7-0). The Tornadoes got fifths from Toria Ingalls in the 800 (2:42.63), Annalyce Bowles in the 1,600 (6:07.07) and Chance in the shot (31-7 3/4). Sixths went to Bremyer in the 100 (14.03) and 200 (29.14), Katie Hardina in the 400 (1:12.74) and Hannah Cooper in the high jump (4-2). Clyde ended fifth overall with 65 points. Marissa Stockmaster sparked the host Fliers by capturing the 800 (2:36.22), while Kaylee Wampler ended second in the discus (109-04). MILAN — Morgan England captured second and Amelia Boes tied for a runner-up spot Saturday to top Seneca East’s efforts at the Edison Invitational. England’s second came in the pole vault (12-0) and Boes tied for second in the high jump (4-10) to help the Tigers end seventh in the girls meet with 42 points. New Riegel finished 13th (3), getting a sixth from long jumper Christen Hohman (14-7 1/2). Seneca East’s boys took 11th (19) in their meet and New Riegel came in 13th (3). Brock Ferres, Skyler Walker, Alec Gomez and Dylan Young keyed Seneca East by taking fourth in the 4×200 (1:38). Bryce Hohman ran sixth in the 3,200 (10:40.29) for New Riegel.